Power Quality Compensating Equipment: In the existing traction network, Indian Railways has a 25 kV, 50Hz, 1-phase traction system on their network. The main power quality issues for railway traction are Low Power Factor, Harmonics Imbalance, High Maximum Demand, and Poor Voltage Regulation. The prevalent equipment provides fixed reactive power compensation irrespective of the actual load. Delta’s unique and highly efficient iRMS Compensator addresses the reactive power compensation, harmonic current compensation, and 25kV bus voltage compensation, which makes the current at metering point pure and free from reactive and harmonic distortion. Power Supplies for Signalling, Telecommunication and Train Control systems: Delta offers smart power quality solutions to critical railway infrastructure such as signalling, telecommunication, and train control systems with an excellent global track record. These power supplies are based on cutting-edge power conversion technology, are highly efficient, reliable, and safe. Both modular and scalable, they reduce complexity, environmental impact, and total cost of ownership across the entire railway infrastructure. Display & Monitoring Solutions: Delta has significant expertise in developing smart display & monitoring solutions for Passenger Information Systems, Signalling, Telecommunication & Train Control Systems, Traffic Management Systems and Safety & Security Systems for railway operations. Our successful installations include the prestigious Bangalore Metro and Mumbai Metro Rail. UPS & Datacenter Infrastructure Solutions: With its wide range of Uninterruptible Power Supplies (UPS) ranging from 600VA to 4000 kVA, Delta offers a competitive edge to critical applications in need of first-rate power solutions. Reliable, efficient and modular, Delta’s Uninterruptible Power Solutions ensure the continuity of mission critical operations while reducing their Total Cost of Ownership (TCO). Delta has successfully installed its power back-up solutions at Noida Metro Rail. Renewable Energy Solutions: Delta has a full range of solar PV inverters that boast not only industry-leading energy conversion efficiency, but also lead the market in both String and Central Inverter categories. Delta has installations in major railway stations and airports across India including Katra Railway station, Secunderabad Station, Delhi Railway Station, Mumbai Railway Stations, Kochi Airport, New Delhi Airport, Mumbai Airport, Kolkata Airport, and others. The power range of these PV inverters varies between 3kW to 3MW to serve the needs of the residential, commercial, industrial and utility segments in India. EV Charging Solutions: Delta offers a complete range of energy efficient EV charging solutions with DC Quick, AC Chargers and Site Management System. These chargers can be conveniently installed in multiple applications such as parking spaces, highway service, as well as residential and commercial buildings. Join the conversation #DeltaAtIREE2017 About Delta Electronics India Pvt. Ltd.
Delta Electronics, a global leader in power and thermal management solutions organized the 4th Delta Advanced Automation Design Contest at Delta’s Wujiang Plant in China, from July 24-26. The contest which is participated by students from various countries aims to build awareness in automation, to learn new automation trends and to enhance system integration skill among the students. The 4th Delta Advanced Automation Design Contest adopts the concept of advanced industrial automation development from “Industry 4.0” and “Made in China 2025”. Under the theme of “Seeking Smart Manufacturing Talents”, the competition included three major categories: “smart machines”, “smart robot”, and “smart manufacturing”. This year, the 74 teams from China, Taiwan, Thailand and India who were shortlisted for the final contest making this competition an international event. Aside from the Special Awards, the First Prize, Second Prize, Third Prize and Editor’s Awards were also presented among the other 72 teams at the award ceremony on July 26. Many creative and outstanding ideas were brought up by contestants during the contest. Three teams from India representing Lovely Professional University, The NorthCap University and Vellore Institute of Technology, participated in the contest for the first time and presented their design and projects to the judges. All three teams walked away with the appreciation and prizes. PICASO 4.0: The PICASO 4.0 is a Vertical Laser Engraving Automated Solution that integrates Delta’s CNC controller and a multi-axis motion control robot. The solution allows the equipment to move horizontally, and can directly perform laser engraving on various materials including brick walls, concrete, glass, timber, and more. As an utterly innovative solution that does not constraint by horizontal workspace, it can also opt for a variety of tools for painting and cutting. Self-Checkout System in Retail: It is an integrated system consisting of an Android application, a bulk scanning/sealing station with a custom PC-based UI and a boom barrier, all controlled by a local server so as to facilitate faster checkout, reduce waiting time and avoid shoplifting from the retail stores. Mobile Bin Picking Robot: So far, bin picking robots are stationary. In order to extend the workspace of the robot and to make bin picking available for industries, this project implemented bin picking using an autonomous mobile robot. This concept is motivated by industrial applications. The robot grasps the desired object, and then places it in a basket with itself. It then transports to a processing station where the object is to be placed. After the object is unloaded, the robot moves back to the initial point for further picking. As a world-class Industrial Automation brand, we are dedicated to the development of AC motor drives, servo and motion control systems, programmable logic controllers, human machine interfaces, machine vision systems, meters and sensors, industrial control and monitoring software, and industrial robots. Our Industrial Automation solutions extend to a broad range of industry applications, including electronics, textiles, food, pharmacy, rubber and plastics, packaging, printing, woodworking, and machine tools. We integrate our automation products, equipment networking, system software, IoT technology, and big data analysis to build innovative and reliable smart, green factory automation solutions for global customers, and to realize our promise of “Automation for a Changing World”. Delta, founded in 1971, is a global leader in power and thermal management solutions and a major player in several product segments such as industrial automation, displays, and networking. Its mission statement, “To provide innovative, clean and energy-efficient solutions for a better tomorrow,” focuses on addressing key environmental issues such as global climate change. As an energy-saving solutions provider with core competencies in power electronics and innovative research and development, Delta’s business categories include Power Electronics, Automation, and Infrastructure. Delta has 163 sales offices, 64 R&D centers and 39 manufacturing facilities worldwide. Throughout its history, Delta has received many global awards and recognition for its business achievements, innovative technologies and dedication to corporate social responsibility. Since 2011, Delta has been selected as a member of the Dow Jones Sustainability™ World Index (DJSI World) for 6 consecutive years. In 2016, Delta was selected out of 5,800 large companies by CDP (formerly the Carbon Disclosure Project) for its Climate Change Leadership Level. Azure Power (NYSE: AZRE), a leading independent solar power producer in India, has been granted INR 678.3 (US$ ~10.5) million of low-cost debt financing through the SBI-World Bank: Grid Connected Rooftop Solar PV Program. The loan is for 15 years with an interest rate of 8.35% per annum, one of the lowest interest rates availed by a solar power developer in the Indian solar sector to date. The loan will be utilized to scale Azure Roof Power, Azure Power’s solar rooftop platform. Azure Roof Power offers superior rooftop solar power solutions for commercial, industrial, government, and institutional customers in cities across India to lower their energy bill and meet their greenhouse gas (GHG) emission reduction targets. With over 100 MWs of high quality, operating and committed solar assets across 14 states, Azure Roof Power has one of the largest rooftop portfolios in the country. Azure Roof Power customers include large commercial real estate companies, a leading global chain of premium hotels, distribution companies in smart cities, warehouses, Delhi Metro Rail Corporation, Indian Railways and a Delhi water utility company. Under the SBI-World Bank: Grid Connected Rooftop Solar PV Program, the World Bank and the International Bank for Reconstruction and Development (IBRD) approved a line of credit of $625 million to support the Government of India’s goal to expand rooftop solar to 40,000 MWs. Azure Power (NYSE: AZRE) is a leading solar power producer in India with a portfolio of over 1,000 MWs across 18 states. With over 100 MWs of high quality, operating and committed solar assets, the company has one of the largest rooftop portfolios in the country. With its in-house engineering, procurement and construction expertise and advanced in-house operations and maintenance capability, Azure Power provides low-cost and reliable solar power solutions to customers throughout India. It has developed, constructed and operated solar projects of varying sizes, from utility scale to rooftop, since its inception in 2008. Highlights include the construction of India’s first private utility scale solar PV power plant in 2009 and the implementation of the first MW scale rooftop project under the smart city initiative in 2013. Azure Power | New York Stock Exchange Azure Power (NYSE: AZRE), a leading independent solar power producer in India, has announced that it has commissioned a 100-megawatt (MW) solar power plant in Andhra Pradesh. The project was auctioned by NTPC, which has a AAA debt rating and is the Government of India’s largest power utility. The solar plant has been set up at Kurnool Ultra Mega Solar Park with a total capacity of 1,000 MWs. The solar park is being developed by Solar Park Implementation Agency (SPIA) and Andhra Pradesh Solar Power Corporation Limited (APSPCL). Azure Power will supply power to NTPC for 25 years at a tariff of INR 5.12 (~USD 7.9 cents) per kWh. Spread across 500 acres of land in Andhra Pradesh, the project will help in electrifying the nearby areas. Speaking on this occasion, Inderpreet Wadhwa, Founder and Chief Executive Officer, Azure Power said, “With the commissioning of this plant, we have once again demonstrated our strong project development, engineering, and execution capabilities. We are delighted to make a contribution towards realization of our Hon’ble Prime Minister’s commitment towards clean and green energy, through solar power generation. Our sincere gratitude to NTPC and the State of Andhra Pradesh for all the cooperation and support extended.” About Azure Power Azure Power (NYSE: AZRE) is a leading solar power producer in India with a portfolio of over 1,000 MWs across 18 states. With over 100 MWs of high quality, operating and committed solar assets, the company has one of the largest rooftop portfolios in the country. With its in-house engineering, procurement and construction expertise and advanced in-house operations and maintenance capability, Azure Power provides low-cost and reliable solar power solutions to customers throughout India. It has developed, constructed and operated solar projects of varying sizes, from utility scale to rooftop, since its inception in 2008. Highlights include the construction of India’s first private utility scale solar PV power plant in 2009 and the implementation of the first MW scale rooftop project under the smart city initiative in 2013. For more information, visit: www.azurepower.com. Mr. Sunil Gutte is the Managing Director of Sunil HiTech Engineers Ltd. has an enterprising vision for the company given recent accolades in both power and non power business. They have bagged several projects this year, moving ahead from infrastructure and construction sector to newer avenues, which had added to their stock value immensely. In 2016, when the total revenue for 16 Qtr II has increased by 19.65% to Rs.497.46 Crores from Rs.415.77 Crores in the corresponding period last year. Delta, a pioneer in display solutions, installed a state-of-the-art video wall solution for the Smart City project in Jaipur, Rajasthan to monitor various operations for city-wide management. The Jaipur Network Operating Centre (NOC) is an initiative of the Jaipur Development Authority (JDA) which will enable JDA officials to keep a check on all the activities in the city on one large screen. Equipped with Delta’s Full HD Videowall, the NOC integrates all recently developed digital infrastructure such as intelligent kiosks, wireless broadband, sensor-based dust bins, smart streetlights, parking, and app, among others. “The city is set to become the most tech-savvy one in the country. All the feeds coming from various sources are integrated under the Network Operating Centre. Delta’s Video walls at the centre would assist JDA officials to manage the city with greater efficiency and effectiveness,” said Mr. Vaibhav Galriya, Commissioner, JDA. JDA, the nodal agency of the government of Rajasthan, has been assigned with the task of transforming the city into a smart hub that would ensure 24/7 surveillance and facilitate on-line access to wide-ranging information about the city at the click of a button. “A state-of-the-art Network Operating Centre (NOC) has been established inside the JDA office. A 35ft wide video wall and fully integrated software application provides easy-to-use and highly flexible management tools for multi-site monitoring from the control centre. It enables the operator to survey infringements such as zone intrusions, lifting of objects at monuments, and line crossings, by sending alarms and pop-ups on a regular basis,” explained Mr. Devesh Gupta, Assistant Engineer, JDA. With the inauguration of JDA’s NOC, the Pink City, Jaipur becomes the first in the country and in South Asia to monitor and operate smart city infrastructure using a single network. The government has developed the NOC at the JDA headquarters. The facility is equipped with Delta’s state-of-the-art video wall and was inaugurated by the Chief Minister of Rajasthan, Ms. Vasundhara Raje. JDA is a body constituted under Jaipur Development Authority Act 1982 (Act. 25) as a statutory vehicle to implement the urban development of Jaipur as envisaged by the Department of Urban Development and Housing, Government of Rajasthan. JDA is charged and empowered to create basic infrastructure to meet the needs of the ever-increasing population and also for the required expansion of the city ensuring sustainable and orderly growth supported with effective monitoring and regulation through innovative and citizen participatory approach. Delta, founded in 1971, is a global leader in power and thermal management solutions and a major player in several product segments such as industrial automation, displays, and networking. Its mission statement, “To provide innovative, clean and energy-efficient solutions for a better tomorrow,” focuses on addressing key environmental issues such as global climate change. As an energy-saving solutions provider with core competencies in power electronics and innovative research and development, Delta’s business domains include Power Electronics, Energy Management, and Smart Green Life. Delta has 153 sales offices, 61 R&D centres and 40 manufacturing facilities worldwide. Delta Displays, a division of Delta, is a pioneer in developing professional displays for control rooms in surveillance, security, traffic, command & control, utilities, process control, telecom and broadcast applications. Delta offers a wide array of display technologies including: rear projection DLP® video walls with Laser and Next-Gen LED technology, Xtra thin-bezel LCD video walls, and high-resolution indoor/outdoor LED displays with a powerful & highly flexible Wall management Software suite. Delta India, part of Delta Group, a leading global provider of power and thermal management solutions, introduced integrated Delta Building Solutions at ACREX 2017 from 23rd to 25th February at the India Expo Mart in Greater Noida. Delta, as an ACREX 2017 Building Automation Partner, demonstrated Delta’s Building Solutions which are capable of inter-compatibility with Delta’s full-spectrum of energy-saving, energy generation and energy storage systems such as BMS, HVAC, elevator, lighting, EV charging, PV, and more. Delta also showcased its leading-edge industrial automation technologies focusing on its broad spectrum of AC motor drives, AC servo drives, PLCs, industrial PCs and panel PCs, HMIs, IoT routers and industrial Ethernet switches, power regeneration units, smart sensors, machine vision solutions, power meters, flow meters, temperature controllers for smart, green buildings and factories. Delta Building Automation Solutions are featured with a comprehensive and integrated building management and control platform, which has been applied to many buildings globally to improve the operation efficiency of building systems and to reduce management complexity and cost. In 2016, Delta Controls and LOYTEC joined Delta Group with their comprehensive product lines and rich knowledge in building automation solutions, which will enhance Delta’s overall building automation portfolio and global market presence. An integral part of Delta’s portfolio is BMCS (Building Management & Control Systems), an IoT oriented, cloud-ready and all-in-one platform that enables intelligent, eco-friendly and highly-efficient management of buildings and their respective underlying sub-systems, including HVAC (heating, ventilation and air conditioning), lighting, security, power generation, and more. Delta’s BMCS is uniquely compatible with all international communication protocols installed in buildings, including BACnet, Modbus, EnOcean, LON, M-Bus, KNX, OPC, and DALI. Since 2006, Delta has built 23 green buildings worldwide. The new Delta Americas headquarters building in Fremont, California, which has been certified as a LEED Platinum green building and is targeted to achieving the Net Zero standard. The new building is a solid example of adopting Delta Building Solutions and BMCS to improve building energy efficiency. Whether in cross-building, cross-regional or cross-system applications, Delta’s intelligent building solutions and products help building managers achieve optimal efficiency in their daily operations and maintenance tasks, and enhance people’s health and productivity. *Disclaimer: The capitalized terms “DALI”, “LUX”, “LonMark”, “BACnet” or other marks mentioned herein are trademarks of their respective owners and are referred only for explanation or descriptive purpose and to the owners’ benefit, without intention of use or infringement. Delta has been operational in India since 2003 and is a 100% subsidiary of Delta Electronics, Thailand. With ten regional offices, three manufacturing facilities at Rudrapur, Gurgaon and Hosur and two R & D centres in Gurgaon and Bangalore, Delta has a strong presence across India with more than 100 channel partners. Besides catering to the Indian market, Delta also exports to several countries including Nepal, Bangladesh and Sri Lanka. Delta, a global leader in power and thermal management solutions, announced today it will demonstrate its expanded portfolio of display and monitoring solutions for diverse applications at ISE 2017 in Amsterdam. The newly-launched 4K DLP® Laser Video Wall solution, available at Delta’s booth, will shine not only with its unrivalled 4K resolution and 2,400-lumen brightness, but also with its best-in-class 560mm-depth extra slim form factor. Vivitek, a brand of Delta, present at its own booth, will feature, among others, the newest additions to the Vivitek NovoConnect Family: the NovoEnterprise and NovoTouch, wireless collaboration systems, and its newest digital signage solution, the NovoDS4K. The newly-launched 4K DLP® Laser Video Wall is the only one in the industry offering 4K-resolution laser cubes with 560mm-depth extra slim form factor. The unmatched 4K (3840 x 2160) resolution, 2,400-lumen brightness, brightness uniformity (? 98%) of its 70-inch cubes and its built-in auto-correction system, Intelli-Sense, make this state-of-the-art solution the most effective choice for critical applications such as surveillance, disaster control, traffic supervision as well as broadcasting. Intelli-Sense monitors various parameters of the system and automatically performs real-time adjustments needed for 24×7 operations. This superior video wall is also the first in its kind within the industry to offer IP6X protection rating. Our full line of video walls become comprehensive display & monitoring solutions by leveraging Delta’s various vision control systems. The DVCS (Distributive Vision Control System) platform is a high-performance IP-based control system designed to fulfill the sophisticated needs of control room applications. With DVCS, operators can manage multiple video sources on a single display, enlarge a single video signal to multiple displays or enable centralized control of several video walls. With 60fps, DVCS ensures perfect continuity of images across multiple cubes. Alternative control systems developed by Delta including the embedded system MiNiCON and the Windows-based Icon PRO, will roll out their respective capabilities for our visitors at ISE 2017. For indoor applications requiring captivating images, Delta’s 1.9mm Pitch LED Displays are the ideal choice given their value-added properties such as 1,000-nit brightness, 3,000:1 contrast ratio, black SMD technology and native 13-bit color processing. Moreover, their modular, lightweight yet rugged design will impress system integrators who will experience this solution through an interactive display at Delta’s booth. The new Laser Ultra Show Throw (UST) projectors, DH765Z-UST series and DW763Z-UST series. Both projectors promise to marvel with their design, which delivers up to of operational time extraordinary 20,000-hour lifetime lampless laser light source, 3,500-ANSI lumen brightness and 12,000:1 contrast ratio. The NovoEnterprise can be used to inject a new level of participation into your next conference room meetings. By pairing the NovoEnterprise with one of Vivitek’s state-of-the-art projectors, participants can take turns easily sharing content right on the conference room wall, whether it is a picture on their phone from a recent event or a pertinent graph that is saved on their tablet. An Ultra HD 4K 75” interactive large format display, the NovoTouch LK7530i, which integrates NovoConnect technology with an interactive display, is a user-friendly wireless presentation and collaboration solution. The interactive display supports up to a 20-point finger touch capabilities (10-point writing, 20-point touch). It is the perfect solution for wireless presentation and content sharing. It includes additional enhanced functions, such as voting and polling. The highly versatile NovoDS4K, an innovative digital signage solution for generating dynamic and customizable multimedia content in minutes through its wireless system architecture. This technology is designed to enhance advertising results in a wide range of applications. Welcome to Delta’s and Vivitek’s showcases at ISE 2017, the largest AV systems integration show in the world, from February 7 to 10 and held at the Amsterdam RAI. Delta, a global leader in power and thermal management solutions, participated in the Energy Storage India Expo-2017 held at Nehru Centre, Mumbai from 12th– 13th January, 2017. 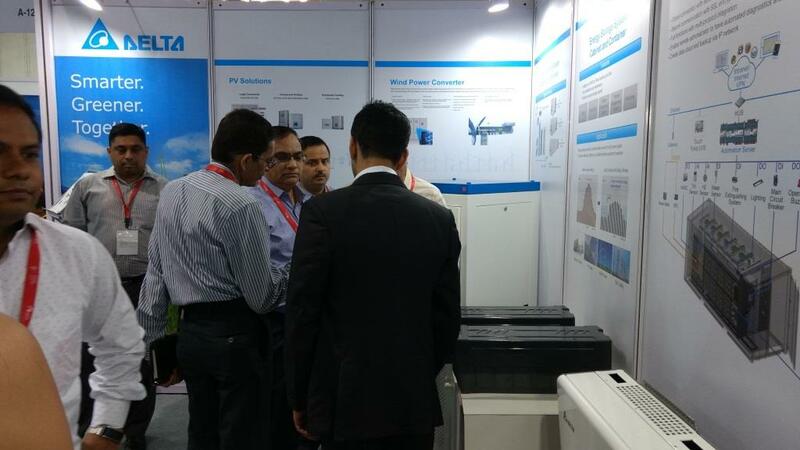 Delta exhibited its latest state of the art technology in Lithium-Ion Batteries (Cell, Modules and Racks), Energy Storage Solutions (Containerized Storage), Power Conditioning Systems and Energy Management Systems at this premier show. Delta has acquired the lithium-ion battery technology through its acquisition of MHI (Mitsubishi Heavy Industries) lithium-ion division which brings in a batch of patents along with the cell to module to system level capabilities. Delta’s DBS48V50S battery module is an excellent energy source with a long service life for applications such as commercial energy storage systems and renewable energy storage systems. Its ready-to-go design provides advantages such as the flexible and easy configuration of battery systems ranging from 48V to 900V based on application requirements. In order to make sure cells are in the same operating condition, it has built-in Cell Monitor Unit (CMU) to manage the cell balance, monitor and collect individual cell’s temperature and voltage. The MWh scale system is capable of overcoming the challenges faced by the irregular and unpredictable energy generation in renewable systems as well as the balancing of the Grid for utilities applications. Delta’s modular energy storage system is ideal for peak shaving and time shifting in utility grids as well as for back-up power in telecom and data centre applications. Delta was established with a clear mission: “To provide innovative, clean and energy-efficient solutions for a better tomorrow.” With state-of-the-art power conversion and energy storage technologies, Delta’s Energy Storage System (ESS) offers high-efficiency power conditioning capabilities for demand management, power dispatch, renewable energy smoothing and more. Delta’s Li-ion battery portfolio covers cells, modules, cabinets and containers, which offer customers excellent scalability and adaptability for a wide variety of requirements. Delta Electronics India Pvt. Ltd. has been operational in India since 2003 and is a 100% subsidiary of Delta. With ten regional offices, three manufacturing facilities at Rudrapur, Gurgaon and Hosur and two R & D centres in Gurgaon and Bangalore, Delta has a strong presence across India with more than 100 channel partners. Besides catering to the Indian market, Delta also exports to several countries including Nepal, Bangladesh and Sri Lanka. Throughout its history, Delta has received many global awards and recognition for its business achievements, innovative technologies and dedication to corporate social responsibility. Since 2011, Delta has been selected as a member of the Dow Jones Sustainability™ World Index (DJSI World) for six consecutive years. In 2016, Delta was ranked by CDP (formerly the Carbon Disclosure Project) at the Climate Change Leadership Level. Avantha Group Company CG has won a significant order of USD 105 million (INR 720 crore approx.) from PT PLN, the state-owned electricity company of Indonesia, to manufacture and install Power Transformers ranging from 30 MVA, 70/20kV to 500 MVA, 500/150kV. CG’s power transformers will be installed across PT PLN’s transmission network, spread over multiple substations and power plants in Java, Sumatra, Kalimantan, Sulawesi and the Papua islands of the Indonesian archipelago. The contract was secured through a highly competitive open book bid that involves passing through stringent quality checks. CG was selected for this prestigious project due to its successful track record in Indonesia, backed by a global recognition of its technical expertise in manufacturing and supplying state-of-the-art products and solutions. The scope of the project includes site survey, design, manufacture, transportation and installation of the transformers. The order falls under a project funded by PT PLN to enhance the performance of the Indonesian transmission grid, which is critical to PLN’s 35 GW Fast Track Programme. This order also reinforces the existing strong relationship between CG and PT PLN. Since 1993 CG has excelled in meeting power transformer needs of PT PLN locally and this seventh consecutive order in the open book series, reinforces the strong relationships that CG builds in all markets that it serves. CG’s High Voltage Switchgear manufacturing plant that will come in production later this year, further endorses CG’s commitment to play a vital role in the growing South East Asian market. Commenting on this prestigious win, Avantha Group Company CG’s Managing Director & CEO, Mr. K. N. Neelkant said: “We thank PT PLN for this significant order that reaffirms their trust in CG’s manufacturing expertise. At CG we have consistently built on our reputation as a quality provider of indigenously built products that meet both global standards, as well as local conditions. Our technological edge makes us well positioned to support utilities in their network strengthening goals and we look forward to many more similar collaborative efforts”. Avantha Group Company CG is a global pioneering leader in the management and application of electrical energy. CG provides end-to-end solutions that meet all electrical needs of its customers. CG’s offerings include electrical products, systems and services for utilities, power generation and industries.